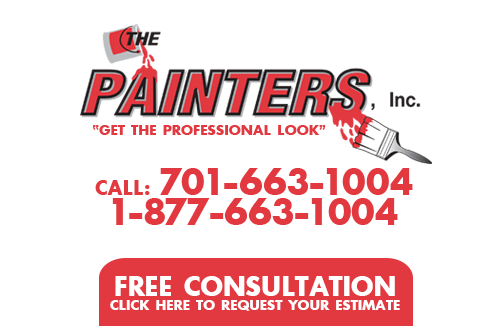 Testimonials - Painting Contractor Reviews | The Painters Inc.
An answer to one’s prayers! Quality work, on time and thorough, clean, gracious staff. ♥ Loved Sandy – Sandy was wonderful to have here in my home. She did beautiful work and everything was cleaned up so well. I would recommend you to any person who needs painting done. We were very pleased with your service. Your painters, Trevor & Cesar, were pleasant & so efficient – they completed the job in less time than expected in spite of time taken to help with moving some items we were unable to. We also appreciated suggestions on one wall with special effects that we are happy with – thank you! Very good work. Outstanding for me. If I ever need more work done I will definitely call your company. I will recommend your company to others if I have the opportunity. Very professional, very friendly & very good!!! Chris & Don & all the employees of The Painters/Precision Wood Finish were exceptionally professional. We had a sizeable mess with our doors & woodwork. Chris & Don took a bad situation & turned it into a very enjoyable experience – it isn’t always easy to fix someone else’s mess & they not only fixed it but made our project look new! So glad we had Sandie & Josh as our painters. Had such a great time with them every day. Did an excellent job of painting – would recommend them! The Painter’s are the best of the best. We had what I call a big job. It was done professionally and in a timely manner. Trevor was a joy to work with. Don and his professional team are easy to work with! The quality of their work is excellent! We were very pleased! Great company to work with! Friendly, positive and professional! The PAINTERS are high-quality professionals. I am very pleased with their work and most certainly would highly recommend them. We were very happy with the results. Sandie did an excellent job. Turned out better than I expected. It made an old worn out kitchen new. I was real happy with the workmanship. First class operation from estimate to finish. We are very pleased with the results of our cabinet refinishing. The staff at The Painters was prompt, courteous, and kept commitments. Our kitchen cabinets look brand new. Thank you! Once again you’ve done an excellent job! Always a pleasure working with Trevor. Looking forward to our next project. Very patient in answering all my questions and addressing concerns. Over the past couple of years we have had pretty much our entire house – inside and out – painted by The Painters, Inc. We are very happy with the quality of their work, as well as the friendliness of all the staff. We highly recommend The Painters, Inc.! The Painters delivered more than expected at a great value. Thanks. We were well pleased with the job. The workers were very careful, thorough and professional. We plan to use The Painters in the future. Thanks so much. Enjoy Don and Christopher – all the crew. Excellent work & very prompt. The painters who work for The Painters, Inc. all do an excellent job. They are quick, careful, friendly and they clean up very nicely each day! The Painters did an amazing job on my cabinets from golden oak to white! The gel stain on my front door turned out fabulous and greatly improved the look of my home. Everything looks great! Sandie did a great job on everything she touched & we couldn’t be happier. Thanks Don & Cindy! We are very pleased with the quality of services your team provided. We truly appreciate the care taken with our home furnishings, floors, etc. During the interior painting project. Sandie and her team were very professional. The work crew were very cooperative and careful with the painting we had done. This is the second time we used The Painters and we were extremely pleased with their work both times. Thanks for a great job! Another excellent experience with The Painters! Competence, clear communication & efficient. Thank you! The work done was excellent & The Painters were very professional. We were well pleased. Trevor did a fantastic job. He is very skilled in texturing & his suggestions were extremely helpful. Very friendly & professional staff. The Painters arrived on time and did a very good job. This is my first experience hiring painting done & I would recommend The Painters, Inc. for a professional job. Foreman and crew were very professional. They kept me informed as the job progressed and brought any concerns to my immediate attention. Problems were deal with efficiently and the work was completed in the time allotted. I was completely satisfied with the work. We love our newly painted kitchen cabinets! Great job Sandie & Josh. Everything was great. The communication was fine. I’ve been working with Spaces and also very busy and I think affected the communication. Ella is great. Trevor and his team were very precise – quality workmanship. Excellent work with good attention to detail. Your promises were kept. Thank you for your integrity! I am already recommending you to friends. This is the second time we have used The Painters and both times they have done a good job and we are very pleased. The house looks great. We have received compliments from our neighbors. They did a great job – very detailed work filling in all the cracks in the siding and made sure that it looked good. We are very pleased! Our project was handled very well from start to finish. Everyone was very friendly and efficient. We are very pleased with a job well done. Sandie was great to work with. Matched stain. Good eye for color. Great job – very accommodating. Will use you again in the future! We are repeat customers and have always been completely satisfied with the quality of workmanship and the professionalism and friendliness of Sandie and her crew. Thank you! We are very pleased with the paint job completed throughout our home. Good work, you can use me as a reference anytime. "Great job- Painters were so cooperative, nice, and very professional! Thank you!" We love the job that the Painters did. All the workers were polite hard workers & very careful about protecting furniture, etc. Trevor is an amazing leader for his crew & great to have around. Thanks everyone! The company was absolutely fantastic to work with! We couldn’t be more pleased! The job was done extremely well and the office communication was the best (really kept us informed). Sandy was a great foreman/forewoman, and most cooperative! We’ll be recommending you to others! The completed project is beautiful. Sandy & Mark were friendly and considerate every day. Sandy’s skills are the ultimate – awesome. I’m very happy with the new look and will call The Painters for any future painting projects. We are very pleased with the end results. A wonderful professional job, an eye for minute details. Another area that impressed me was how careful the guys were with the plants & lawn in my yard. Thank you for the great job that was done – we are so pleased. Very well done – two “very nice” young men did a great job! We are very pleased with the paint job for our sanctuary ceiling at McCabe United Methodist Church in Bismarck, ND.Paint crews were professional, polite and kept everything well protected while painting. We'll be happy to recommend your company to others! Don is very professional and personable. The team of painters did a great job. They put everything back when done and are respectful of our home and us. "Thanks Don, for following up on my question about the trim on the exterior peak. We enjoyed working with you.Love the stairwell wall! The service was fast and friendly!" Trevor was very professional. Pleasant to work with and very good about explaining how he was staining our kitchen cabinets and how to care for woodwork and answered all our questions. Will surely use The Painters for any other job we may need in the future. You did an awesome job on the doors. They look so nice! We are very happy. Great job on our interior paint job. Your employees are professional and friendly. Ben and Josh were great to work with; they took their time and were very respectful to me and our property. Our house looks so nice and it surprised me that they were washing windows! Excellent work and I wouldn’t hesitate to hire The Painters again. I am happy with the job. The staff, beginning with Don & continuing with everyone I have come in contact with at The Painters have been very professional. They take pride in their work and it shows. Thanks for a job well done! Thank you for a good professional job and the excellent customer services! More companies need to follow your example. The Painters were thorough, working steadily & carefully. They were prompt and let me know when they were coming and if they had to leave for a time. I appreciated the job getting finished in a timely manner. Outstanding work and process. Lee was wonderful to work with. I was impressed with the initial visit by Donald & his complete and through explanation of the work to be done – I immediately accepted his bid – I had no other estimates done. Lee and Josh were very friendly, professional & thorough as well and kept the work area clean. They did a beautiful job and I am pleased with their work! Thanks! We highly recommend The Painters for any painting project. We had them do interior and exterior painting for us and found the staff to be very professional and efficient. The quality of their work was exceptional. A special thank you to Trevor and Christian who did the majority of our project. They were fantastic and did an excellent job for us. Don – I am very pleased with your business and want to thank the gentlemen that worked in our home. I have before/after pictures if you’d ever need them for future use! Your services will come highly recommended. "We were so pleased with everyone involved in this project. The two guys that did the actual scrapping andpainting did an incredible job! The deck looks fantastic and they were so neat and clean. The whole project wasa real joy. Thank you so much." I was pleased with the final outcome and appreciate the courteous manners of everyone working on this job. Excellent service, a fair price and a very professional job. Fine work! I appreciate it! As a General contractor I utilized Don Klym’s services (The Painters & Precision Wood Finish) for over 18 years. Each residential and light commercial project we completed was a success. Recently, as a retired home owner, I called upon Don’s services and could not be happier with the end results and attentiveness of Don and his team. I was very happy with to response from the office, to the estimate process, the active work process. Whole process was very professional. Great Job! I am happy with the work you did on my house. It looks great. Thank you. Was impressed, very good excellent job, very prompt. The painters were very courteous and they provided an excellent service in a timely fashion. Needed service in a certain time period and it was excellent work, exceeded expectations – Thank you, will use this service again. I have already spread the word! (Efficient & Very Neat) Great Experience!! We are extremely satisfied with the Painter’s experience. Very happy, again! This is the second time we have had work done by The Painters. We are happy with everything. The work was done on time and in a very friendly and professional manner. Thank you to your whole staff. Sandy, Gary and Trevor did a wonderful job of patching, texturing and painting my ceilings and walls. They were efficient and effective, great personalities, fun to have in my home. You are blessed to have such great employees!! Cindy is excellent on the phone really on top of the job. We are completely satisfied with the timelines and quality of your workmanship. Your painters were very easy to work with and they were dedicated to doing a top notch job. Special thanks to Ben your Lead Painter. The workers (painters) were very polite. Took a lot of pride in their work. Your company did a great job. The two men did the painting were great. The estimate was thorough & professional. We were kept informed from estimate to completion. Professional, pleasant and clean. Appreciated the calls keeping me up to date on when painter would arrive. Sandy and her co-worker did a great job. Enjoyed doing business with Donald Klym. Thank you. Very excellent job! Very careful and concerned for quality. The painter was very helpful in recommending the amount of coverage needed & willing to stay & add another coat even though we had not originally planned it. I was very pleased with the work that The Painters, Inc. did in my house. They did a professional job and I was pleased with the overall customer service. Workers did an excellent job. Your people were very nice to work with and extra willing to advice when questioned. I found your staff to be extremely professional. We love our painted bedrooms. The painters (Trevor and Adriane) were so courteous of our home & property. We’d definitely hire you again. Thanks so much. All of the painters were very neat & professional. They had to work in a busy area but they got the job done quickly and with very nice results. I also appreciated that they were always here when they said they would be. I would highly recommend The Painters to anyone. Your painters, Todd & Bruce were professional, communicated well, answered all question. They were congenial and efficient. We are more than happy with the work done and will use you in the future! Outstanding work. Trevor was wonderful! Our only regret was that we didn’t call you sooner. Every detail was to our satisfaction, including preliminary cleaning and sanding. We can recommend your work and follow-through, as well as your conscientious painters! It was also convenient to have our mahogany deck chairs done right on site at the same time. Not only did The Painters finish removing wallpaper, painting, and painting the ceilings in less than a week upstairs in my home but they exceeded my expectations with the quality of workmanship, attention to detail and friendliness of staff. I would recommend The Painters and use them for future painting needs. Excellent job! What a plus to have Ed for my windows. He not only is a top-notch painter, but he was able to do some minor repairs, which I really appreciated! I will be telling my friends! The work was done very neatly and satisfactorily. Ryan and Bill are painters without attitude. They perform as professionals with experience and knowledge. Their pride shows. It was a pleasure working with you guys. Thank you for the superior job. It was very hard to rely on contractors but you guys rocked. I’m so pleased! I was very pleased with the professional quality of the work, it seemed that no spot was missed. I can’t say enough positive about the whole job. Don, you were very prompt with your estimate and follow-up, your crew was always on time and did a wonderful job. Everything was done with as little disruption to us as possible and the job was finished a day before expected. Very impressive all around. I will definitely recommend you folks! We are very happy with the quality of work done in our house. Very clean, organized and professional! Thank you for the professional refinishing of the inside of all the many windows in our home. I am so very pleased with the results. Todd handled it all so very well. I certainly will recommend The Painters, Inc.
We really appreciated Ryan & Richard and of course Don, who was very patient with me. We well be very happy to be a reference. Thanks for a great job. A job well done. I would recommend The Painters for everyone. The job was completed in a quick time frame, and it was done perfectly. They did a great job! Very professional and friendly. When we need to paint again we will call you! We appreciate the professionalism of The Painters. Did a great job of matching the stain on the woodwork! The Painters were punctual, professional and excellent workers, even working on a Saturday to complete the job according to the contract. I would not hesitate to use The Painters again. A great group of “painters” on a most challenging job. Don, Cindy & crew provided care and concern for my job from the beginning estimate through completion. The quality of work, the courtesy of the painting crew all made for an enjoyable experience ending in a job well done! Trevor, Bruce & Ryan were a complete joy to work with. Looked forward to them coming every day. Wow!! They were very enthusiastic and stayed on task. Fred and I appreciated it and will strongly recommend your company (The Painters) to others that need service of painting and all the other things your company does. There you go Don - another extremely satisfied customer. I would hire your company again. It was very satisfied with all aspects of the painting job. We would recommend your company to everyone (and we have). Trevor & Todd did a fabulous job! They were timely, efficient, and had a great sense of humor. They were conscientious of doing a great job! I would definitely recommend “The Painters”. Enjoyed doing business with your company, look forward to requesting your services in the future. It was exceptionally clean when they were done. I was surprised by how clean it was. Very nice job! Sandy & Trevor were great to work to with, very professional. Thanks so much for doing such a great job! You went above and beyond. The painters were very friendly and hardworking! The quality of the finished product is excellent and we could not be more pleased. The work areas were left clean at all times. The staff communicated with us during the entire process to let us know the progress and what we should expect. We will request their assistance for future projects. Enjoyed working with everyone. Excellent job and love the suggestions. Don-thank you for your help. The colors were wonderful! Thank you for an exceptional job. We enjoyed working with Don and his help picking out colors. A special thanks to Todd and Ryan who did an awesome job turning our flood damaged house into a home again. We appreciate the courtesy, promptness and most of all the professionalism shown to us. We will be sure to call you again the next time we paint! Our painters were knowledgeable, gracious, willing and flexible. The workmanship is top-shelf!! The administrative portion was dependable and detailed. Highly recommendable and will use this company in the future. I was very satisfied with the work, the time spent painting and neatness. When I want more painting I will contact you! Todd and Steve were awesome! The guys were great and respected that we still were running a business while they were working. Great crew! Awesome work! Very easy transition so we could continue to keep out store open and help customers! Thank you! In a hectic world, this was a wonderful experience! We could not be more satisfied! Thank to Don and all the crew! Thanks for the great job! Your service and the friendliness of your staff were top notch. I am so pleased with the paint job The Painters did on the trim on our garage and garden shed. It was in bad shape and now it looks like new. Thanks for doing a good job. I love my living room wall the most! I was so impressed how nice and honest Don, Cindy and the painters were that came to my home. It’s encouraging to know we still have people like you. I can’t thank you enough for taking care of me quickly and for doing such a fine job! Couldn’t be more pleased. You are lucky folks to have such fine employees with your firm. Thank you so very much! One again, thank you for a great job and ease of doing business with you. We appreciate it! We were impressed with the painters who worked on our house. They were very friendly and willing to answer any questions we had. We also appreciate how the company went above and beyond what was in the contract to make sure out home looked as good as it could. You have our business in the future and we will recommend you to anyone looking for painters. Excellent job by The Painters! The Painters did a great job. We have two different colors on the wall and the ceilings. Their attention to detail was excellent. I would recommend them to everyone. Don and Cindy are excellent to work with and there prices and very competitive. Thanks for a job well done. Very professional. Highly recommend The Painters. Trevor and Adriane did a wonderful job painting the house. We would talk things over before painting the different colors on the walls. They were very detailed in their work and wanted it to be just right. They were very professional, courteous, and neat and cleaned up each day. Thank you for doing a good job! Mine was a small half day painting project and they worked it into their schedule between larger projects. Working with The Painters crew was an all-around pleasant experience. The Painters have completed several projects in our home. We appreciate the professionalism and the excellent job that they do for us on each occasion. We would recommend them to anyone that wants a quality paint job or wallpaper removal done. They work very diligently to get the job done. We have always been very impressed with their workmanship. The Painters continue to do excellent work for us. Not only do they do a great job, but we particularly appreciate how nicely they clean everything up every day! I was really impressed with the level of professionalism of your crew and the quality of their work. Precision Wood Finish has been great to work with in all areas from the person answering the telephone to the fantastic shop guys and gals. I have been very happy with all of my projects, they keep me posted as to time frame and will call me if they have questions and concerns. I am very happy that I am doing business with them. A very good business environment is created by doing business with people who turn in results and not simply excuses. That is why The Painters have been doing all of our painting and wood finishing for the past several years. It is with absolute certainty, we think that kind of relationship will prosper and continue. I thought your work was excellent. It saved me a lot of time and it saved me any possible injury. Thanks again. Awesome job, very professional. Service was second to none. Looks good! Good work we were happy with service, cooperation and being prompt and timely to get job done when outside work is questionable due to weather conditions. I was very impressed with every aspect of your service. The job I hired you for was painstaking and it was done meticulously, promptly, and well! Why did I wait so long to ask for your help? I’m so pleased with the results. The work was completed within days of my first phone call to Don. The workmanship was very professional, but the customer service and personable, friendly crew was outstanding. Thank you. You did a very good, were prompt on getting here when you stated the time. Painter was very neat, very easy to work with. We would recommend your company to anyone that asks. We are very pleased. Quality is Top Notch! Value is priced quite high, but sometimes quality and service will triumph a higher price. Well done. We are very happy with your work. "We are very pleased at the outcome of our project. Ryan, Todd, and Bill had to remove 25 years of oldwallpaper and then paint. They did a great job and we really appreciate their hard workI will definitelyrecommend The Painters." "We are very pleased with the Painters project and would not hesitate to refer you to others." "No hassles. Your staff was very easy to work with. We got a professional job the first time!" "I would recommend the Painters without hesitation, and will continue to use their services." "Your company did a wonderful job. We will use you again! Thank you." "Treated flower bed very gently. Diligent workers, very professional. Also, very upfront about the costs- nohidden costs." "We were very please with the service we received. I would recommend the Painters to any of our friends. Theydo a very professional job." "We were very pleased with your work and would recommend you to others." "My house was painted in a timely manner; the staff was pleasant, efficient, and professional. Care was takento avoid injury to my yard and property. It was a pleasure to do business with The Painters." "Dependable- I liked the fact that you checked the work while it was in progress, and the follow up." "I am completely satisfied with work- deck looks very nice." "We would not hesitate to call the Painters for any further jobs. You did a great job! Thank you." "We are very pleased with your work. Painters were very professional and clean." "Super- Very meticulous painters! The professionals of your company are outstanding. Thank You." "I called several painters in the Bismarck/Mandan area. Some didn't even return my calls. The Painters werevery professional from the first phone call to the rapid estimate to the excellent work, down to the last brushstroke. I was also impressed with the people who actually did the work. 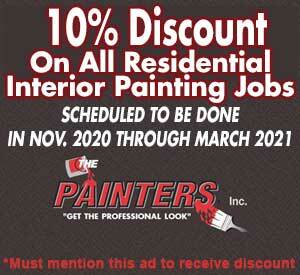 I will recommend the Painters Inc.without reservation." "Ryan and Ryan were super to work with. They did an outstanding job for us. Don and the staff at The Painter'sInc. were so easy to work with and their professionalism was great. Thank You!" "Excellent work and service. I will, and have, referred others to you." "Excellent work, very easy to work with Don and his staff. Your staff worked very well with us and they werevery flexible the entire crew was great!" "Everyone did a great job from start to finish. The guys were very courteous and always kept us informed oftheir progress. Thanks to Don and Cindy for all the follow up calls during the painting job. I would highlyrecommend your company to others and would definitely use your company again." "Thank you for the great job. We are very happy with your work and will call again when additional painting isneeded. You should be very proud of your great customer service." "Very professional. The Painters left my family room looking like no one had been there other than the newpaint color on the walls! Very clean!" "Our experience with The Painters was wonderful! They were a very professional company, prompt with allcommunications. They had a daily work plan so the project was completed in a timely manner. Both Ryan and Toddworked well together. They were very skilled and hard workers. At the end of each day, everything was cleanedup and out of the way. The painting is beautiful. We are so pleased with the results we definitely willrecommend The Painters." "I am pleased with the final product. My husband commented that it feels like we now live in a three-dimensional home instead of a sterile white box." "I was totally satisfied with The Painters. They did an excellent job. Very neat and courteous." "We were very pleased with the results. This window painting project involved a lot of detail work, which wasvery nicely done. Don Klym was always very responsive to any questions or concerns we had. " "I appreciated the promptness on receiving a bid and being able to get a variety of work done in a timelymanner. The people at all levels were very professional, I would highly recommend The Painters, Inc. "
"You and your work crew treated our home as if it were your own. Outstanding year after year. Thanks! " "We were very pleased with how thorough and neat your painters were. I will highly recommend your services toanyone I know who needs painting done." "I am overall very pleased with The Painters, Inc. service! You were very pleasant to work with. 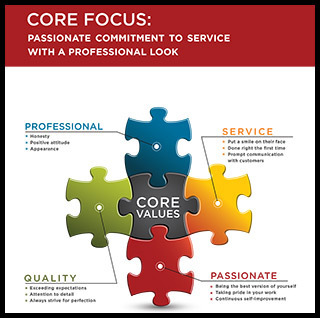 One of themain reasons we chose you was the prompt service." "Your employees were courteous and productive. The job looks great, thanks for all the detail work, you reallypreserved the historical integrity of the house." "Thanks for coming back to do the touch ups so quickly. " "Thanks for the advise, we were very impressed. The Painters were great - tidy, polite, and took care to checkand answer any questions before it was too late. We will very definitely call you when we finish the next partof our project. The final look is perfect - we love it." "I was concerned about making a change from wallpaper to painted walls. The Painters handled every problem weencountered. Ed was very knowledgeable and took care of everything. There was never a mess! The paint job wasvery professional. I was very satisfied with the look of the paint and the quality of the workmanship. In twodays I had an updated kitchen! " "Excellent job. I am very happy and satisfied. This is the fastest service I have ever received. I called onSaturday and the painting was done by Thursday. Thanks, I will be saying good things about The Painters." "Awesome! What an outstanding company. We would recommend them in a heartbeat!! We had a time consuming projectand they were wonderful. We basically have a NEW house. The painters were very professional and courteous.There was no mess outside when they were done." "I wanted to find a local company. One whose business residence was in Mandan and I found an excellent one. Imvery satisfied with their services. Dons guys are very courteous, respectful and professional. Loved the wayeverything looked after clean up every day. Love the look of my house now. Thanks everyone!" "Aside from weather related delays, we were 100% satisfied with the quality of the work. The project was notcheap, however, there was no worry about issues related to WSI coverage, liability insurance, contract licenseetc. The crew on the job were absolutely first rate pros!" "Your employees were very kind and considerate about working around us in small quarters. They did a very goodwork and were fun to have around in spite of the mess. I would not hesitate to have you work for me again or torecommend you to anyone else. Thank you." "I appreciated the good workmanship and professional manner." "The staff was friendly and professional. They were prompt." "Weve really enjoyed working with you." "I couldnt believe how quickly and efficiently the job was completed. I was impressed with the professionalismand courtesy of everyone with whom I had contact. I will, whole heartedly recommend you to my friends. Thankyou, so much!!" "Very impressed with the work and the workers were very good." "The workers were prompt in starting the days work as well as being clean and stayed at the job wasting notime. We would recommend them to anyone. A job well done." "We have had many compliments on the appearance of our deck when the work was completed. All personnel werevery pleasant to deal with. Thank you!" "Everyone was very nice and courteous. I am very impressed with the quality of the staining, especially the sixpanel oak doors. They look nicer than the doors we have upstairs that were done by the builders sub-contractor.Thanks again for the fabulous job." "Very professional, worked quickly with little wasted effort. Made sure conditions were favorable for paintingexterior. Did touchups as requested in a timely manner. Thanks for a job well done." "The job they did for us was very good. We would not hesitate to give them a reference." "The Painters went the extra mile to insure a difficult job was completed to our satisfaction and in a timelymanner." "I appreciated the fact that you had representatives from Sherwin Williams come to my house to make sure ofwhat kind of paint to use." "I have used The Painters for over 15 years to do painting both inside and outside my residences. They havealways provided top of the line workmanship at a very reasonable price." "Staining our huge fence was a job from hell. The two guys who worked on this task for over two weeks wereremarkable. Ill never know how they were able to hang with it. I tried to do this job and failed on day three,throwing my hands up in despair. We are satisfied customers in the work done & the reasonable cost. We wouldhighly recommend you to anyone." "I dont know how we would have gotten 43 cupboard doors done without your expertise. Good job. The pick-up anddelivery was wonderful." "Bill & Ed were great! Thank you Cindy, Don, Bill, and Ed!" "The guys were very professional, courteous & did great work." "The Painters and all the workers were very pleasant to work with and though in their work." "We have always been pleased with The Painters. Always prompt in all aspects of business. I would highlyrecommend The Painters to friends and family." "Very neat, clean, polite and Professional." "Once again - I am a very satisfied customer! Throughout the whole process, I was very impressed with theprofessionalism and quality. No detail was overlooked. I will use the Painters again without hesitation. Thankyou!" "Fantastic job! Very pleased with a job well done. Would recommend the Painters to anyone." "Your people were friendly and answered any questions we had. Would hire you again. Thanks." "The two guys were very clean and easy to visit with. Thanks for the great paint job." "Thanks, we love the results & I may have Trevor back to do deco around the windows after the windows are installed." If you are looking for Bismarck Painting Contractor Testimonials or Reviews, please call The Painters Inc. at 701-663-1004 or fill out our online request form.